Using Google My Business long has been a murky matter for owners of service-area businesses. 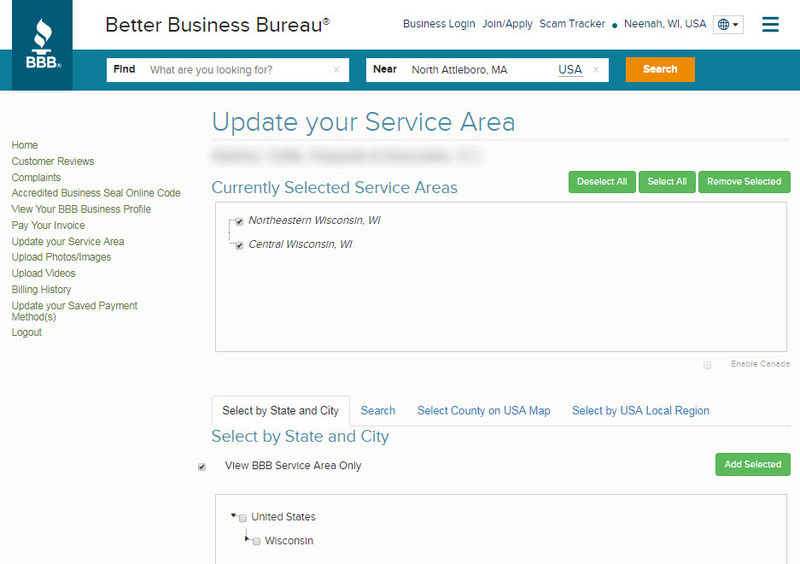 Most people have wondered what kinds of addresses are eligible, how many GMB pages they can have, whether to “hide” their addresses from showing publicly, and how big of a “service area” to specify (or whether to specify one at all). 1. The entire “address” field now appears to be optional. If you’re creating a page for the first time, it’s not clear to me whether still you need to specify an address to get the verification postcard sent to you. Even if you need to specify an address initially, you can wipe the address after you’re verified. 2. Radius-targeting is gone. No longer can you target everything within a specific distance from your place of business. Now you have to specify cities, or states/provinces, or ZIP/postal codes, etc. 3. 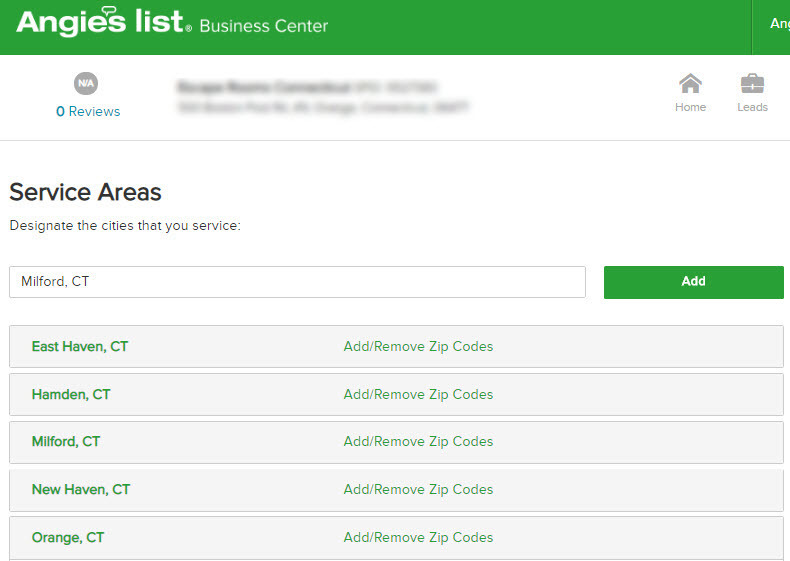 Now you update the “Address” and “Service Area” settings separately, in two separate fields, rather than mess with your service-area settings in the “Address” field. 4. 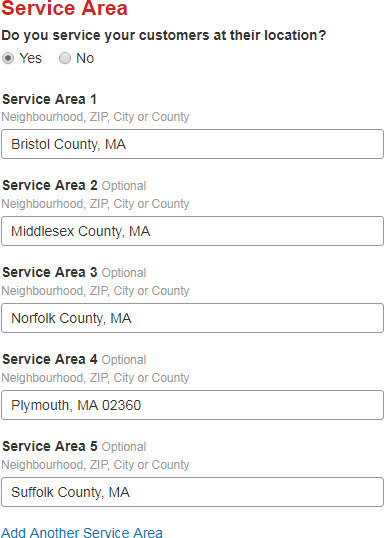 Certain businesses in service industries no longer have their addresses showing in the local 3-pack, even if those businesses never chose to “hide” their address from showing publicly. 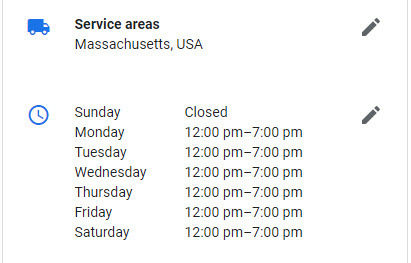 It’s not clear to me whether that’s because Google doesn’t want businesses in certain industries to have their addresses show up in the 3-pack, or because (more likely) those business owners simply haven’t gone into Google My Business today to mess with their address and service-area settings. It’s not yet clear (to me) why Google has made those changes. Nor is it clear whether they’re only the first in a series of changes. Often there is another shoe to drop. My tinfoil-hat theory is Google wants to make it easier for more businesses of a certain type to have a Google My Business page that doesn’t break a rule or three, so that more of them can use Local Services Ads and get into a PPC bidding war with each other. Guess we’ll see. For now, I don’t see a downside to your specifying an address AND a service area, assuming you’re not the owner of a home-based business and are concerned about revealing your address. 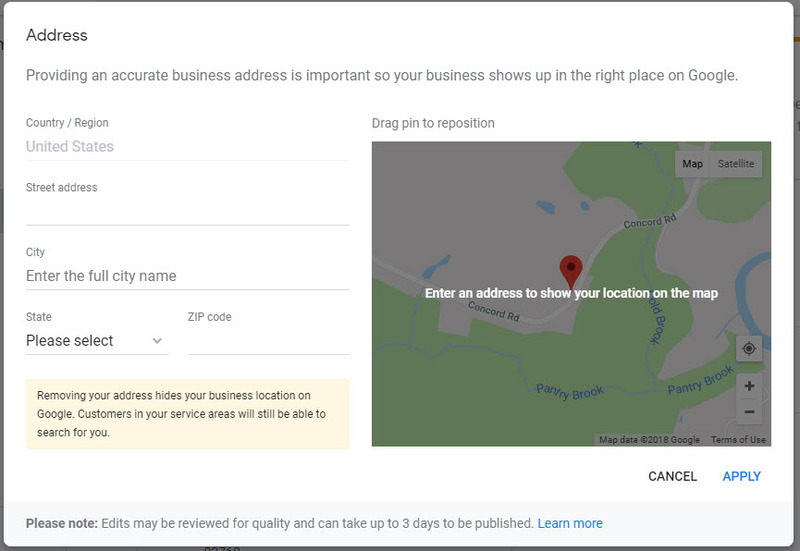 If you do run a home-based business and have privacy concerns, there doesn’t appear to be a drawback to scrubbing your address out of the “Address” field of your Google My Business page. When Google makes a big change like this, business owners are slow to adapt (and many never do) and Google knows that. This is a good time to experiment, while your competitors don’t even know there was a change. Any bugs or problems you’ve run into? Tracking local rankings is a tricky matter if you’re a business owner or professional SEO, and even more so if you’re a maker of rank-tracking software. Yet a local-rankings tracker called Local Falcon came out recently and already has carved out a niche. Local Falcon does one thing: It shows and tracks Google Maps rankings for bricks-and-mortar businesses. 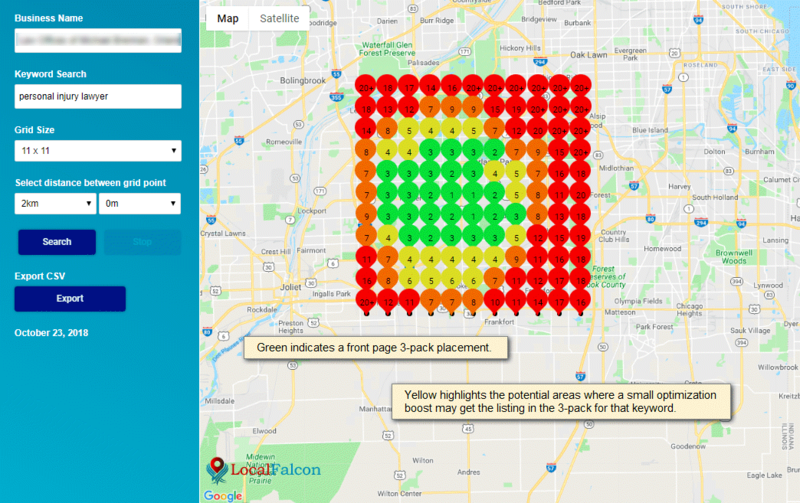 If that describes your need, you may like Local Falcon’s new approach to the old and irritating problem of figuring out how visible you are on the local map. Recently I had a good chat with the creator of Local Falcon, Yan Gilbert. Afterwards I sent him some questions I thought would be on your mind, as a person who does local SEO for your business or for someone else’s. Yan’s answers (below) should tell you how Local Falcon is different, how it might be useful for your business, and how best to use it. Phil: What’s your “elevator” pitch for Local Falcon? 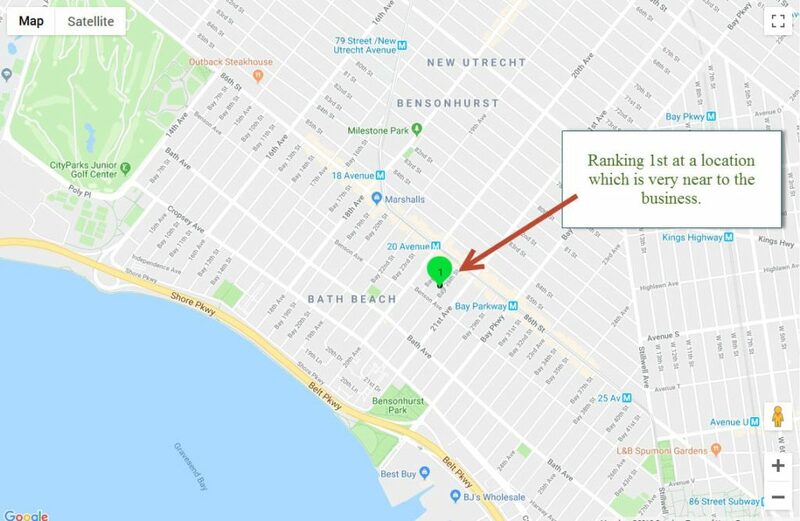 Yan: Local Falcon breaks the standard pattern of rank trackers because it was designed specifically for Google Maps and sometimes needs a bit of explaining for people to see the real value of it. Local Falcon is an exciting new tool that lets you visualize local rankings in a new and easy-to-understand way. The user quickly sees how well a listing is ranking in the area surrounding the business. The way it works is very visual, so let me share a few images to explain the point. Local Falcon shows you the full picture of the ranking coverage area for that keyword. You can then confidently decide if you need to continue optimizing for a keyword within a few seconds after looking at a scan that has returned results such as these. No other rank scanner does this. Ultimately, Local Falcon will save you time in your analysis. With one scan, you can get over 100 data points visualized in a very easy to understand way. 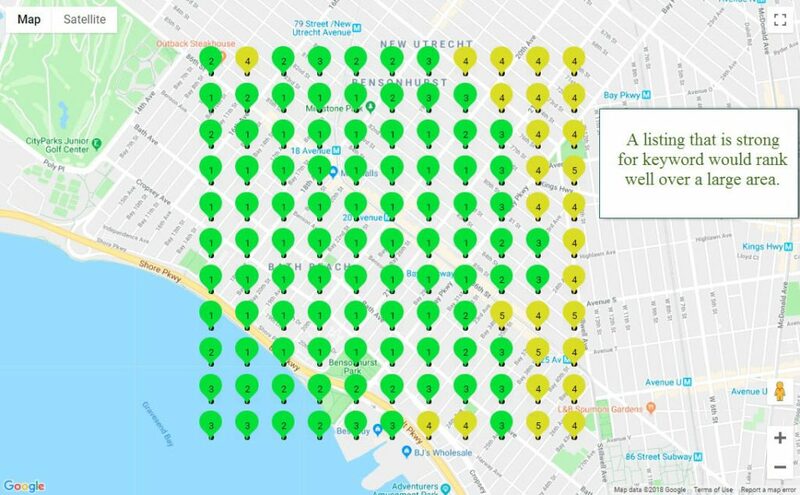 Compare this with having to set up dozens of data points in a normal rank tracker, and then trying to understand how the jumble of ZIP code placements over a city fit together. Phil: Tell me briefly how Local Falcon differs from other local rank-tracking software. Yan: Local Falcon is very different than other local rank tracking software because it’s the first rank tracker specifically designed for checking Google Maps results. Every other tracker out there is designed to track organic rankings, and have appended Maps tracking capabilities. Local Falcon starts with the map, and checks rankings based on distance away from the business and then displays them in a way that is easy to understand. 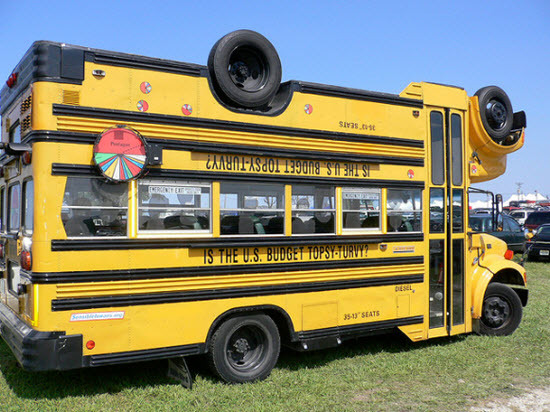 There are no ZIP codes involved. ZIP codes have no bearing on ranking; proximity does. Phil: Whom is Local Falcon geared toward, and who probably wouldn’t have as much use for it? Yan: Since Local Falcon is designed to help businesses easily visualize their rankings, marketing experts at an agency and owners of small-to-medium businesses will find value in using this tool. 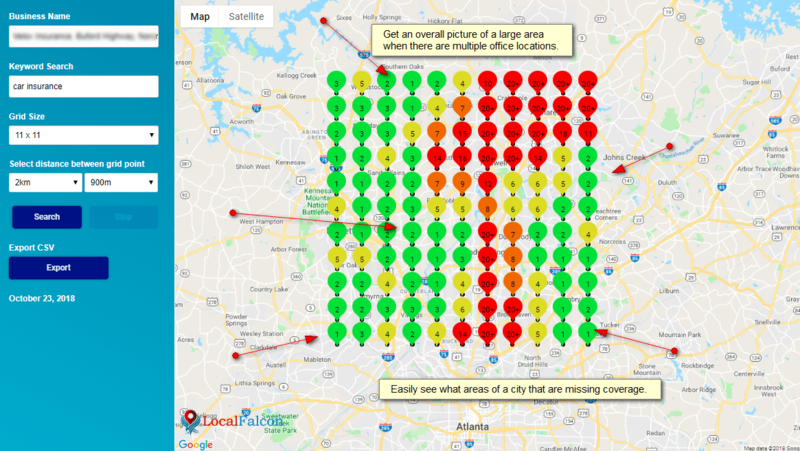 It is especially helpful for businesses with multiple locations because you can scan an entire city in one pass and really understand what is going on. Phil: What does the “Falcon” part refer to? Yan: A falcon flies and looks down at the area below it, which is what my tool does. It’s also a predator, a quick hunter, and so these connotations fit as well because as a marketer my job is to help find the information to help businesses grow. 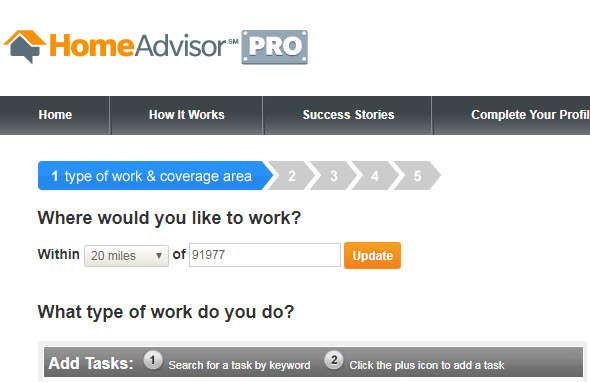 And that’s what this tool is designed for: to help you to make decisions to help expand your business. We spent a lot of time to come up with the name because it was important to get it just right. But there were many constraints. I went through hundreds of combinations and this was the name that grew on us. Phil: Tell me a little about you. What’s your “day job,” and what’s your background (if any) in local SEO and in software? 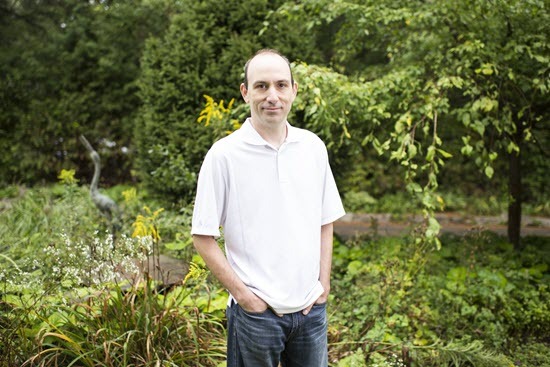 Yan: I’ve been doing SEO for over ten years and local SEO for about two. I had my own clients, which was working well, but then I got a call from Joy Hawkins when she was just starting her own agency, and I didn’t want to pass up that opportunity. It was a very good decision because she really has imparted me with a lot of knowledge and encourages everyone on the team to continuously improve. As for software, I designed the tool with the user in mind; although I’m not the actual coder of the tool, I know what the tool needs to do to be useful, and that’s my main goal. 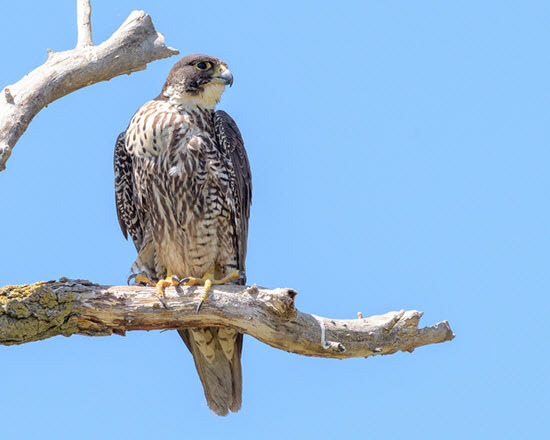 Phil: What’s the story behind Local Falcon? What made you want to make it? What gap do you want it to fill? Yan: Last year, I came across a browser plugin that allowed me to easily change the location data that the browser was sending. This was great because I could quickly simulate a Google search from anywhere and I could easily check rankings for clients without doing a full setup in a regular rank tracker. I looked around the SEO tool universe and nothing like it existed yet. At that point, I considered if I should undertake creating the tool myself and eventually my enthusiasm for the idea won out. Phil: What’s your biggest gripe about other rank-trackers? Yan: The main problem stems with the fact that with Maps results, you need to pick a spot to track from. Whether it be a ZIP or postal code, you are choosing one spot. You can always scan from multiple spots, but because the other tools are not designed for it, it becomes very difficult to put that data together to understand rankings across a large area or part of a city. Phil: Why did you want to get into software? Yan: A co-worker once described me as passionate while I was on a SEO call with a client. I felt that this tool needed to be built for all local SEOs out there. Sure, I could have sat back and at some point someone else might have built something similar, but I didn’t want to have that regret. I knew that no other software had anything like this. And when you have an idea–a new idea that you think is worthwhile to pursue–sometimes you just have to go out there and try it. Phil: Back to Local Falcon. What’s the closest thing to it, in terms of other rank-tracking (or other) software? Yan: I’m not familiar with every software, but through my work with Joy, I had access to many of the top tools that SEOs use. For local tracking, we continue to use Bright Local which does a great job, but it has the same limitation as all the other trackers in that it’s based on choosing one location to scan from at a time. This only gives you one data point to make decisions from. It’s quite limiting because it’s difficult to piece the different locations together into a whole. 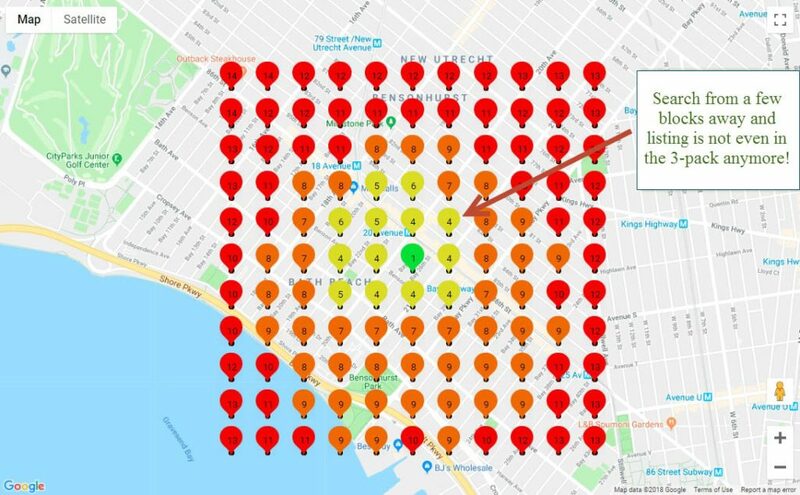 My blog post here gives a good explanation of why: Why You Need to Be Scanning Multiple Map Location Points For Local Rank Tracking. Phil: You want to get people to look at rankings a different way. How should I look at rankings, and what mistake am I probably making now? Yan: I think the old paradigm of checking by ZIP codes has run its course. Proximity of the searcher to the business is what is important, and using specific geo coordinates gives much more accurate results. 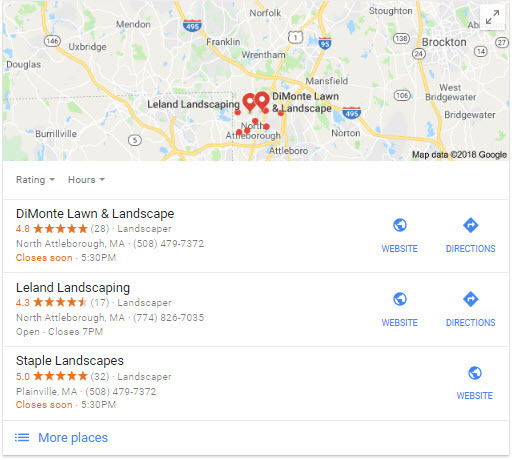 Google has made huge changes to the way local search results work, but the rank trackers are still using methods developed for organic search. We can do better than simple plotted line graphs. As Google evolves, so must the tools. Yan: It was one of those decisions that was made at the outset of the project. 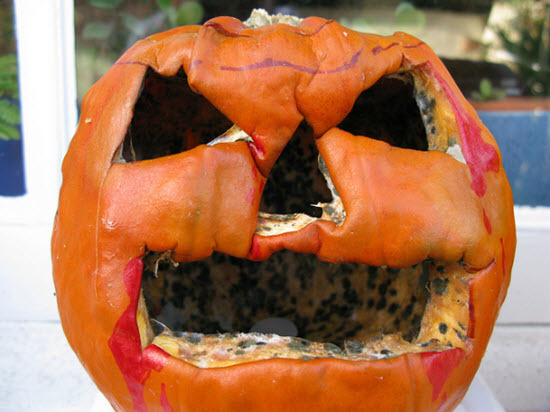 Rank trackers need to scrape because there is no API for organic results; it’s the only way to get the data. But there is an API for Google Places and I felt comfortable going that way. At the time, I didn’t realize the limitation we would encounter for listings with hidden addresses. As well, working with Joy (where we are constantly trying to get rid of listings that break Google guidelines) scraping Google, which is technically not allowed, didn’t feel right. I had an alternative. I also didn’t want that worry hanging over my head of dealing with hundreds of proxies that need to be scaled up. What happens when they get banned, for instance? It happened to Bright Local in September and they basically couldn’t run any scans for more than a week. With the API, the data comes directly from Google in a legit way, and there is no worry about losing proxies; there is no issue in scaling. Phil: How can people validate what they see in Local Falcon? How can I confirm its accuracy? Yan: This is obviously important: it has to be accurate. And a lot of testing has been done to make sure that it is. Believe me, if anyone can find an issue with local results it’s Joy, and she really put it through the paces each time I presented an update to her. Another free tool is: https://valentin.app/. I’m not sure who created it, but you can localize a search to a specific area and check that against Local Falcon results. I’ve also written up a short local rank tracking comparison of these two sites with Local Falcon. I’d like to add, however, that sometimes ranking placements can differ with a short amount of distance (hundreds of feet in some cases depending of the competition level) but what you are looking for are numbers that are either the same or within a few placements of each other. Will there be some glitches? Sure. 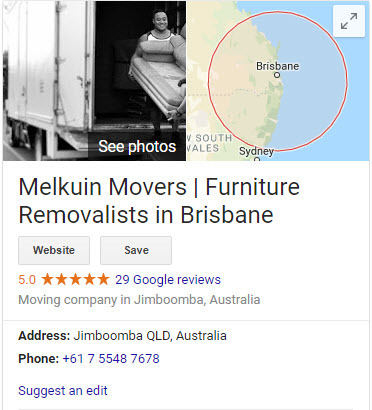 I’ve seen some odd rankings returned for various issues such as the business address on the listing if not formatted correctly or an unknown duplicate listing throwing off results. But if on the odd case that something is wrong, you can easily see it. In Local Falcon, the scan page has a bug report to notify users of any issues. The last thing I want is to show bad results to someone trying to make decisions. Since I come from the SEO side of things and frequently check all sorts of tools and analytics, I am very aware of how faulty data or changes in data collection methods can be frustrating. 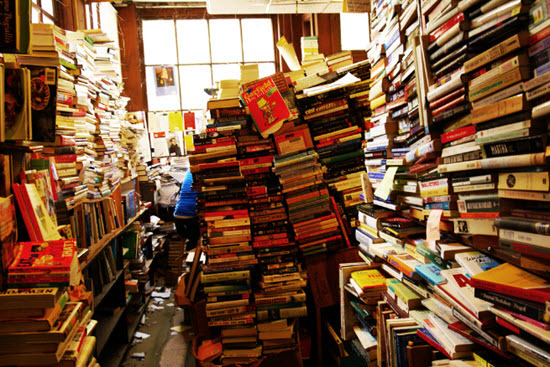 Lastly, definitely use as many sources of information as possible to be comfortable in making optimization decisions. Local Falcon uses the Google API and other trackers use scraping. Different methods exist to get to similar results. 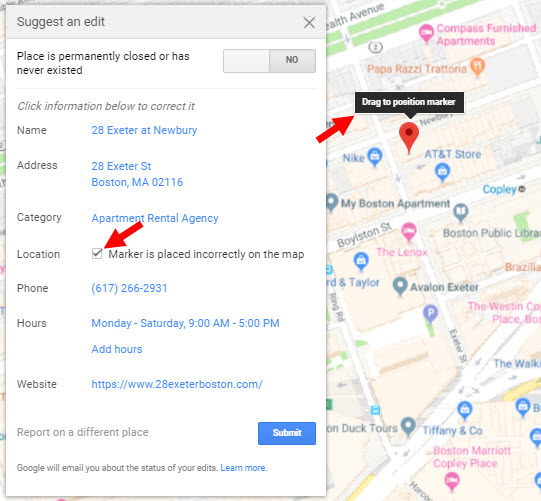 Yan: One limitation to using the Google API is that it won’t give information about business listings that have marked their address as hidden, so Local Falcon does not work for these. These typically include service area businesses such as plumbers and electricians that come to you, the customer. For businesses that list their address such as dentists, doctors, hotels, restaurants, lawyers, and the hundreds of different kinds of stores that you actually need to visit in person, ranking visualization is a game changer. There’s a pared down version of the scan that’s totally free, so it costs nothing to test out to make sure it works for you. At the moment, fixing the hidden address issue will have to wait. Unless Google changes their API there’s not much that can be done unless we restructure the entire coding to get results by scraping. So we are focusing on what works well and delivering the best results and features for those businesses that can be scanned. 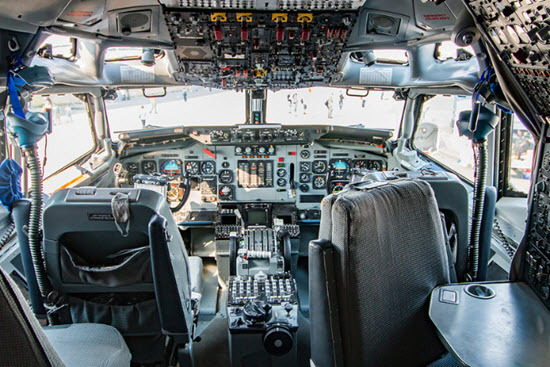 Phil: What part(s) of Local Falcon do you think you’ll never change? Yan: It’s still so new right now so it’s difficult to envision a different kind of product. Whatever new elements we add though, I really don’t think the main visual aspect of the tool would change. So many tools start to get bloated with new features and lose the core of what they started with because they try to be too many things to too many people. Local Falcon does map scanning and I don’t think it will ever diverge from that. Phil: Many ranking software makers (e.g. BrightLocal) study stuff. What would you like to study, perhaps with the help of Local Falcon? There are hundreds of little experiments that can be conducted across thousands of different kinds of businesses, industries, in both high and low competition areas. The way Local Falcon works, you can see if small changes have an impact or not. It’s so difficult to do that now with regular rank trackers because it’s so hard to put the data together in an easy to understand way. At the same time, I’m limited in compiling studies and running SEO surveys . At the end of the day, you want to pay for a product that works, and not necessarily be paying for all those extra hands typing articles that may or not matter to you. I don’t know about you, but I perpetually have so many tabs open on my browser of articles I want to read but never seem to get to. So when I do put something together, I’m going to make sure it has usable and actionable information. I encourage other SEOs to use the tool and run experiments. Not only can you scan businesses with Local Falcon, but you can scan landmarks, parks, and anything physical on Google Maps. 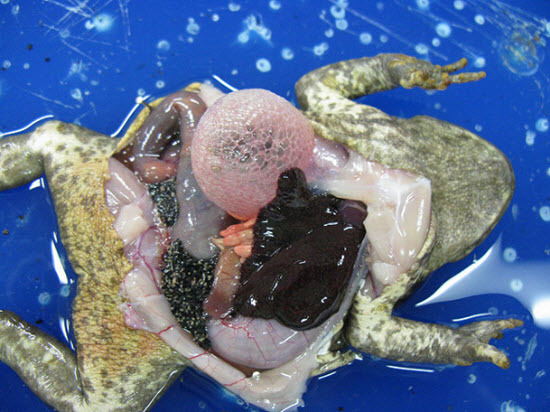 You can play with this information in tons of ways. Hopefully, when experiments are performed, people will share that data because as a whole we will be better able to see inside the black box that is the local search algorithm. Phil: Credit roll: who else deserves credit for Local Falcon? Yan: Although Local Falcon is my own vision and creation, definitely the team at Sterling Sky; Joy, Colan, and Josh. We build on knowledge learned from others, and Joy assembled a great team of people. Working with them improved my SEO skills tremendously and I probably would never have come up with the idea if not for them. They were also my beta testers throughout the building process. They held the standard bar high and I tried to reach it. Phil: If I’m a reader who’s just read our long discussion, what do you want me to do now? Yan: Go to LocalFalcon.com and test out the scan. 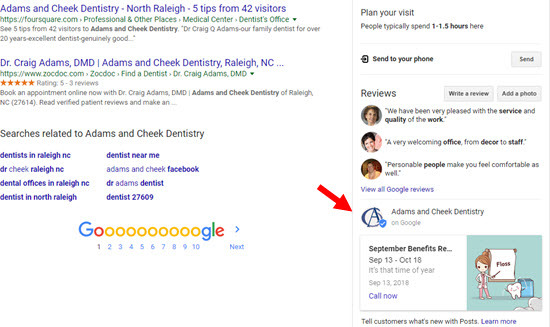 It’ll make you see and think about local rankings in a whole new way. The feedback I’ve had about the tool from experts in the industry is incredible. They immediately saw the potential that it holds. Use the free version until you have a handle on the scan and upgrade to get even more power out of it. Phil: What kind of “VIP” treatment can early users – paid or free – get if they start using Local Falcon now? Why not just wait until it’s been around for longer and works even better? Yan: I haven’t tried to incentivize it as I think the tool is worth using as it is. A lot of development went into it already. There’s a free version that allows you to understand what it does and, at the moment, it’s not time limited so there is no clock ticking to force you to make a decision. I’m hoping that it’s easy enough for people to understand the value. So I’m thinking that users might as well start using it now to get that data. I still have many improvements that I would like to add: preset automated searches is the next main goal–but the reality is that this is not some VC-funded startup. The next phase is a large one and future development in large part depends on people signing up. What you get at this point is a great tool and access to me for any help. I know this tool inside and out, and I know local SEO inside and out. If there are any questions about a scan, or your rankings in general, I am available. At a certain point, it’s possible I won’t be able to provide that concierge service. Phil: When will the paid version be out? Yan: The paid version is there, but you don’t see it right away when you land on the site. You need to sign up as a free user first. Because of the limitation of not working for all businesses, I want to make sure that you use the tool and know that it works for you before you upgrade. If it can scan your business, and you like it then you upgrade. Phil: Any “pro tips” for early users? Yan: Use a smaller grid size first, to check rankings. If you start with a large 11×11 scan and the results are not what you expected, it will waste time. Instead, start with a smaller scan so that you get a feel for the coverage area that a keyword might have and use a larger scan to get a much better picture if necessary. You can sign up for a free trial of Local Falcon here. Any questions or suggestions for Yan? Have you used Local Falcon, and if so, what are your thoughts on it? 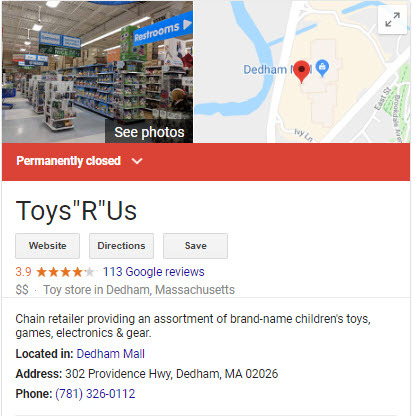 Google constantly tweaks the local search results, but every now and then makes a change that at least seems big. I’m here to tell you the official shuttering of Google+ is not consequential for local SEO, and that your strategy shouldn’t change one whisker. 1. 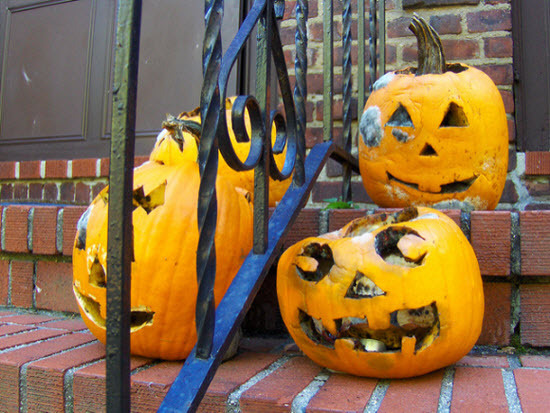 Every time you see what appears to be a big change in the local search results – of the kind seen in 2012 and 2015-2016 – don’t assume it will last. The local search results don’t change that much over the years. 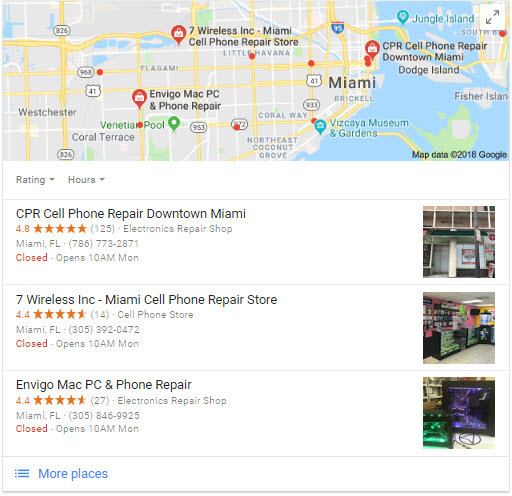 Google constantly adds and removes features, and messes with the layout, but the Google Maps / 3-pack results are remarkably similar to what they were in yesteryears. 2. Everything’s an experiment to Google. Not much is a permanent fixture, and nothing is sacred. When trying out any of Google’s new doo-dads, you need to ask how you can make it a temporary laboratory or Petri dish for your business. The goal is to try out ideas that – if promising – you can develop without using anything owned by Google. 3. 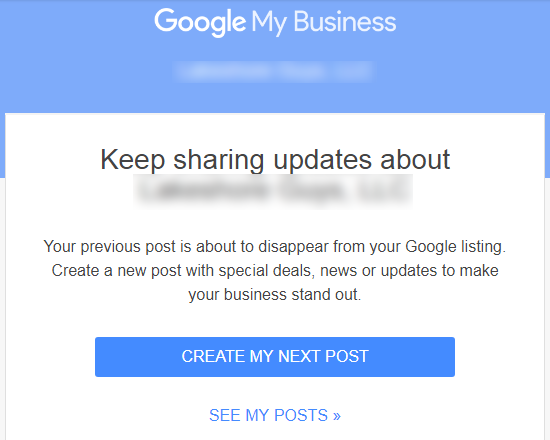 Those duplicate “Google+ for Business” pages are not a problem, have not been a problem for several years (if at all), and soon won’t exist at all. Don’t worry about ‘em. 4. Now would you agree that Google+ probably doesn’t affect your visibility on the local map (and likely never did)? 1. Put your best content (or all of it) on your site, before and maybe instead of throwing it on the social platform du jour. Today it’s Google+. Tomorrow it may be Facebook. If it’s not on a site you own, it’s not content you own. That may sound like a royal pain, but as a longtime content-hoarder who doesn’t even do guest posts, I can tell you it’s best for all glory and links due you to benefit your site, rather than someone else’s. 2. Speaking of content-hoarding, don’t assume Google My Business posts will be around forever. Use them as a way to call attention to what’s on your site, but not in lieu of putting stuff on your site. 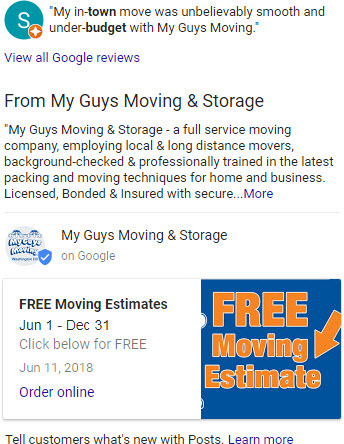 Google My Business posts have promise now, especially if you use them now, but GMB posts are a laser pointer. We’re the cats. Google is the human. I think it’s just a big experiment to see what kinds of posts get the most clicks. GMB posts sure resemble “AdWords ad + a photo.” Once Google determines that, I think they’ll kill off GMB posts. 3. Don’t ask customers for a “Google Plus” review. That’s been a vestigial term since early 2016. Just call them “Google reviews” or “Google Maps reviews” and people will know what you mean, and probably write you one. 4. Scour your site for “write a review” links and other links to your Google Plus page, and update those links. For the past 2 1/2 years there’s been no way to write a review from a Plus page. Soon those links simply will be broken. 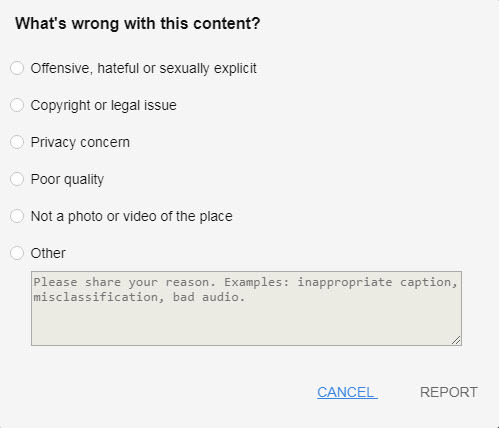 What do I suggest changing those Google+ links to? 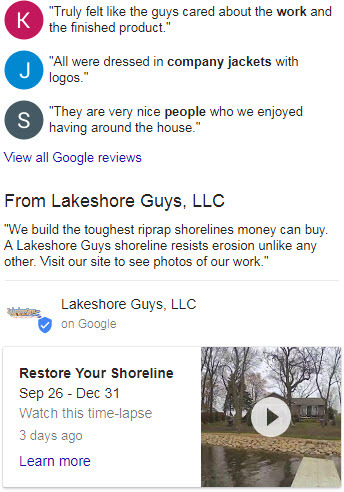 A Google-review link of the kind you can easily create here. 5. Perhaps it’s time to remove those G+ “share” buttons on your site. P.S. 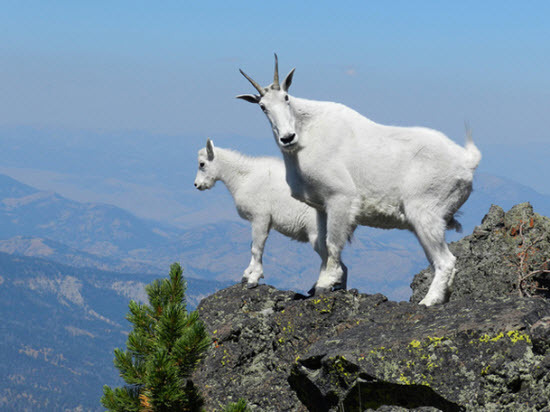 If you’ve been part of the Local Search G+ Community that Max Minzer and I have run for the last 5 years, please check out this post and let us know the direction you’d like us to take next. 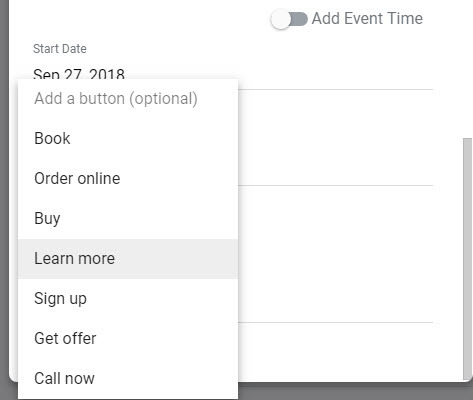 (a) you can call anything you post on an “event,” (2) the end of the “event” can be months away, and (3) if you do those things your GMB post won’t look strange in the search results. 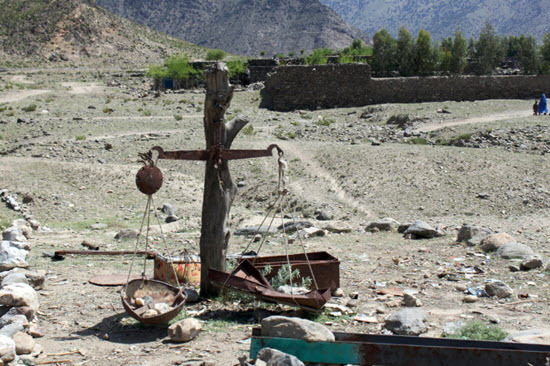 Local-business results were plenty visible before. We’ve long seen them in the Maps 3-pack, in the Maps tab, in the Maps app, and in the local organic search results. 3 suggested searches for specific songs, plus “piano teachers near me.” Loosely related, of course, but which of those items least belongs under that heading of “Explore musical instruments and sheet music”? The results may be Chrome-specific and personalized. For all I know, maybe they’re music-specific. I had been listening to some Irish pub songs on YouTube in the same browsing session, which may have turned Google onto the musical theme. If I watch a cat video, then will I get a nudge toward “veterinarian near me” or “cat psychologist nearby”? The kicker is that when I clicked the link, the local results I saw weren’t great. 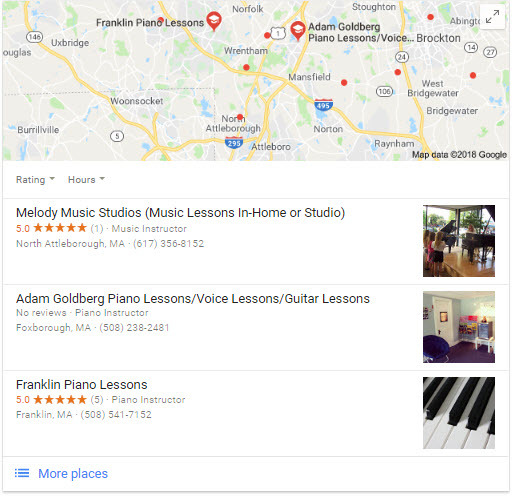 Two businesses with keyword-stuffed Google My Business names, and absent was the very-nearby music school where my wife has taken violin lessons (which you’d assume Big Brother Google knows we like). Anyway, I don’t know yet whether this is just a weird little test. I suspect not, given how over the years the the organic results have become localized, and the ads have seeped into the Maps results, and the Maps results have shown for more terms that used to show only organic results. I suspect this is the next phase of Google’s mixing all the chocolate with all the peanut butter. But who knows. I just caught a little glimpse of something that may or may not be something. Have you seen any suggested local search terms on Google’s homepage / your default Chrome page? 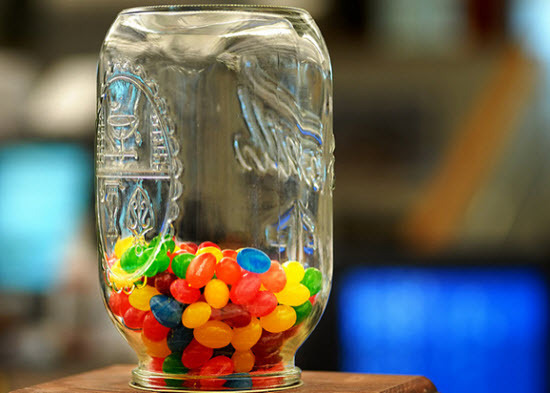 If most businesses use GMB posts already, won’t customers tune them out post? 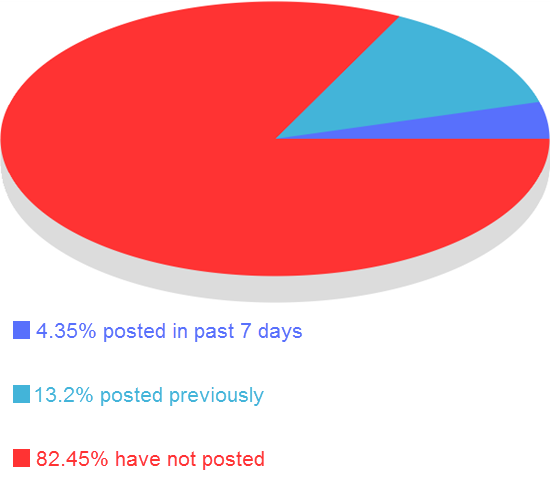 If few businesses use GMB posts, have most people just concluded they’re a waste of time? 3. 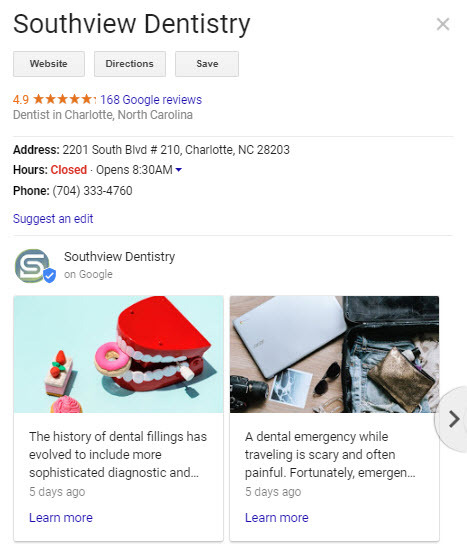 I searched in Google Maps – in the “local finder” – so I could look at a larger sample of businesses. 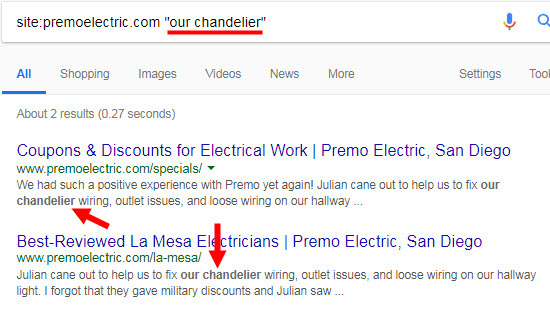 The alternative was to look at the top 3 businesses on page 1 of Google’s main search results, but Google’s main search results don’t show who’s using GMB posts. I’d have to click on each one anyway. 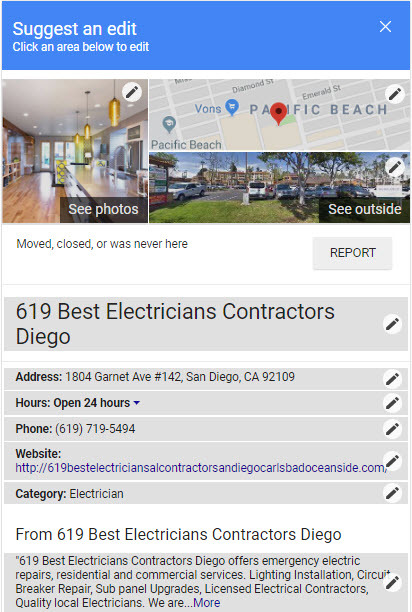 In the “Maps” view, I could pull up a list of 20, and very quickly check each business and see whether it had any GMB posts. What about the red search terms on my spreadsheet? Those represent cases where the search term I originally chose (e.g. 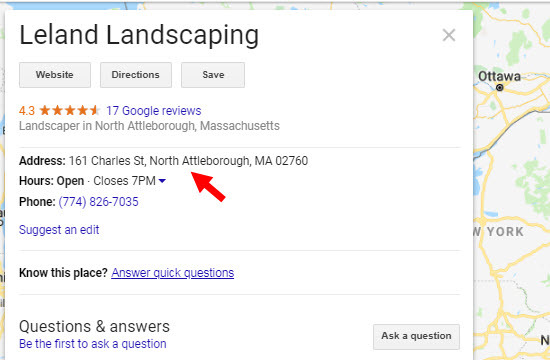 “Boston animal hospital”) didn’t produce a full page of 20 businesses in Google Maps. That would have shrunken the sample size a little, and skewed my data a little, so in those cases I just picked a different search term – one that did pull up 20 businesses on the first page of Maps. Fighting spam in Google Maps is an unpredictable, mushy part of local SEO, and it requires the patience of a monk. 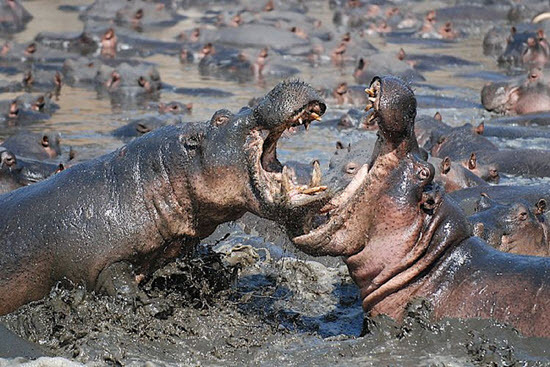 Competitors ethical and unethical come and go, their rankings bob up and down, and Google flip-flops on policies, enforcement, and safeguards. The least-predictable part of all is: what happens to the anti-spam “edits” you submit to Google in your attempt to clean up the map?